– Larry Jaworski, co-chair of the 2012 Stormwater Symposium and past WEF president. Online registration is now open for the Water Environment Federation’s (WEF) inaugural Stormwater Congress in Chicago on October 5-9, 2013. Check out the Stormwater Pavilion and more than 106 presentations related to stormwater. Engage with leaders in the stormwater sector and be part of something innovative and different at WEFTEC® 2013. The stormwater audience and topic is growing rapidly. The Stormwater Congress builds upon WEF’s momentum from the 2012 Stormwater Symposium. Stormwater also has a long and successful history at WEFTEC, and as a result, WEF will expand stormwater offerings and host an integrated event, the Stormwater Congress. Click here to check out WEFTEC 2013 and Stormwater Congress programming. Stormwater Congress attendees have access to the full WEFTEC 2013 program. The Congress encompasses all pressing aspects of stormwater management in 19 unique sessions with 106 presentations. 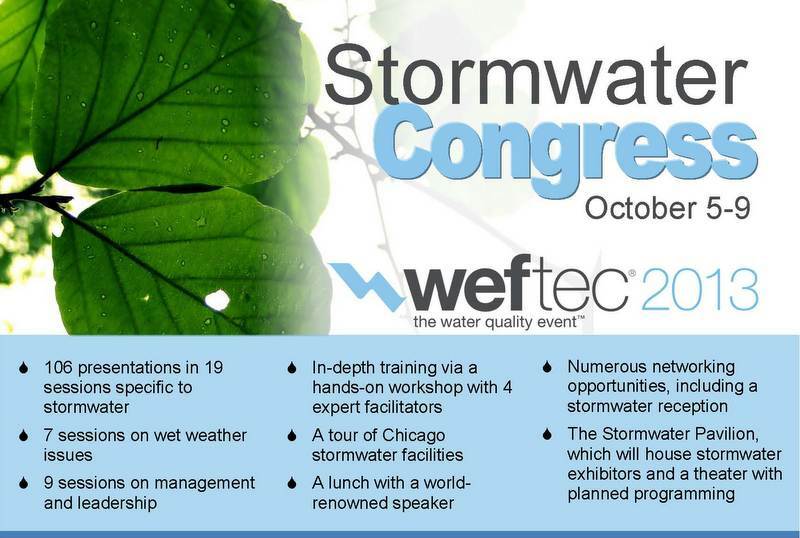 Additional WEFTEC sessions will be available to those who register for the Stormwater Congress, including wet weather and utility management sessions. The Stormwater Congress also includes a workshop, luncheon, exhibits housed in the Stormwater Pavilion, mobile session, facility tour, and other exciting ways to network with colleagues in the stormwater industry. Stormwater Congress attendees can register online using the WEFTEC registration system. Follow these quick steps to receive the reduced Stormwater Congress rate of $725 after mail-in rebate. Stormwater Congress attendees will register at the full conference rate. Onsite Stormwater Congress attendees will receive a mail-in rebate coupon. The fee after the rebate is $725, representing a $150 discount from the nonmember full conference rate of $875. Registration is also available by fax, mail and email.